In May 2015, a test of the breathability of fabrics was performed with the Mayeri Sport Wash gel at the accredited High Street Textile Services laboratory in England (test method BS 7209). Modern textiles for sportswear (Gore-Tex, e-Vent, etc.) are designed to direct vapour away from the body. This basically means that the fabric breathes or is capable of directing moisture away from the body. The textile directs vapour to the top surface, where it evaporates. Vapour can move only in one direction, which means that the fabric does not let moisture and water in. It is import to re-direct moisture in order to maintain an optimal heat mode of skin during your workout. Breathable textiles do not inhibit or decrease sweating, but they allow skin to dry quicker. The more intensive the workout, the more breathable the textile should be. Ordinary washing gels leave residues of washing agents in textiles, which may clog the pores of fabric. As a result, the special features of the fabric, including the capacity to direct vapour away from the body, may even be lost after the first wash.
For testing the Mayeri Sport Wash gel, the Gore-Tex fabric was washed with the agent four times. The breathability of the fabric was tested after each washing. This was done by covering a water container with the fabric and by heating the water for 24 hours. 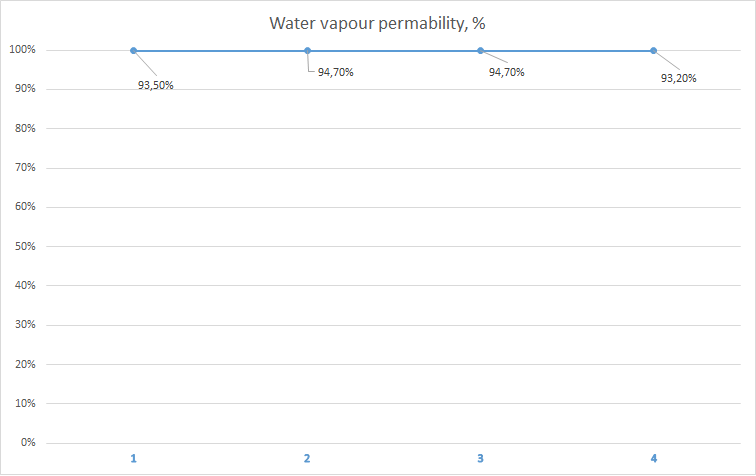 After heating, it was measured how many grams of water the fabric had let through and the results were converted to percentages. The results of the test are shown on the Figure below. The results of the test indicate that the Mayeri Sport Wash gel does not clog the pores of the fabric and maintains its capability to direct moisture away from the body.